For over a year, Powertech executives have been publicly claiming that the ground water aquifer they would like to mine in is not suitable for drinking and that no one is currently using the water for domestic purposes. They assert they can inject a solution into the aquifer that will liberate millions of pounds of uranium and other toxic heavy metals without affecting a single existing water well. The map below reveals that several hundred domestic and agricultural water wells exist in and around the proposed mining area. 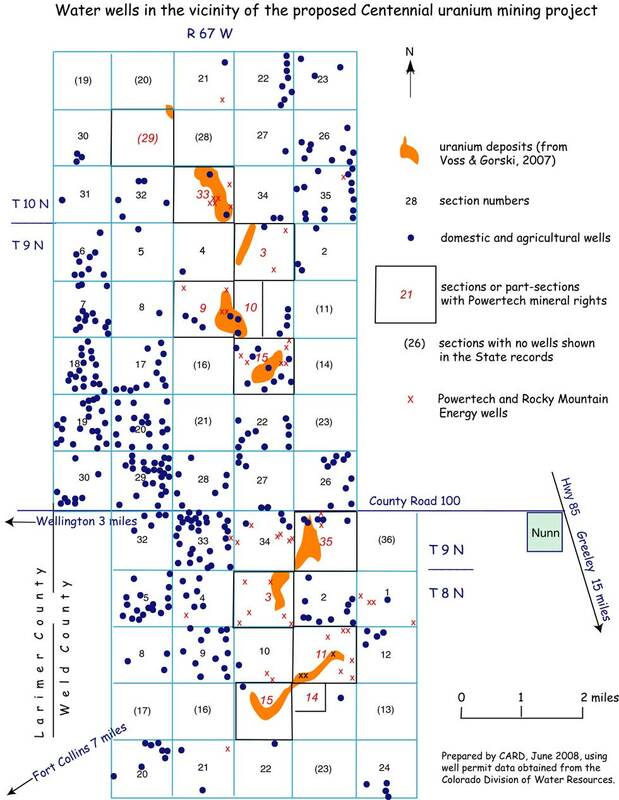 The map includes 65 sections (65 square miles) including the roughly 10 sections that Powertech owns mining rights on, and 55 sections that surround the Powertech land. The map was prepared by retired CSU professor Sam Kunkle, using water well data from the Colorado Division of Water Resources and the NI 43-101 "Compliant Resource Estimate" report prepared by Powertech consultants. The location of individual wells is approximate and is taken from CDWR online maps. Approximately 340 domestic and agricultural wells exist in this area, including 25 wells that are located within the Powertech-controlled area. About seven wells appear to be located directly above uranium ore bodies. Some wells located in close proximity to uranium deposits may contain elevated levels of uranium and should be tested and the water treated to remove excess uranium if possible. Other wells in the area meet state and EPA drinking water standards. All wells are at risk of being contaminated with radionuclides and heavy metals if Powertech is allowed to conduct in-situ leach mining in the aquifer. As the map shows, the ground water aquifer in the area surrounding Powertech's proposed ISL mine is a source of drinking water for thousands of people and animals. Powertech is wrong -- this is not an appropriate location for a uranium mine.